It's the bread. It's warm. And crackly. Is banh mi my favorite type of sandwich? Some days, yes. I am currently infatuated with Asian food, almost as much as I am obsessed with sandwiches. But there is something about banh mi that is bigger than just a temporary craving. It goes deep, straight to the heart of what makes a sandwich great. If we are to believe the origins of the sandwich -- that some rich dude playing cards demanded that his meat supper be served between two slabs of bread, so he could eat without using both hands or a knife -- then I put forth the theory that banh mi, among other types of sandwiches, is something of an evolution of the species. Sure, there is meat tucked inside bread, but that is not what makes it great. Yes, there is a balance of taste (salty, sweet, spicy, sour) and texture (crisp veggies, mushy cold cuts). 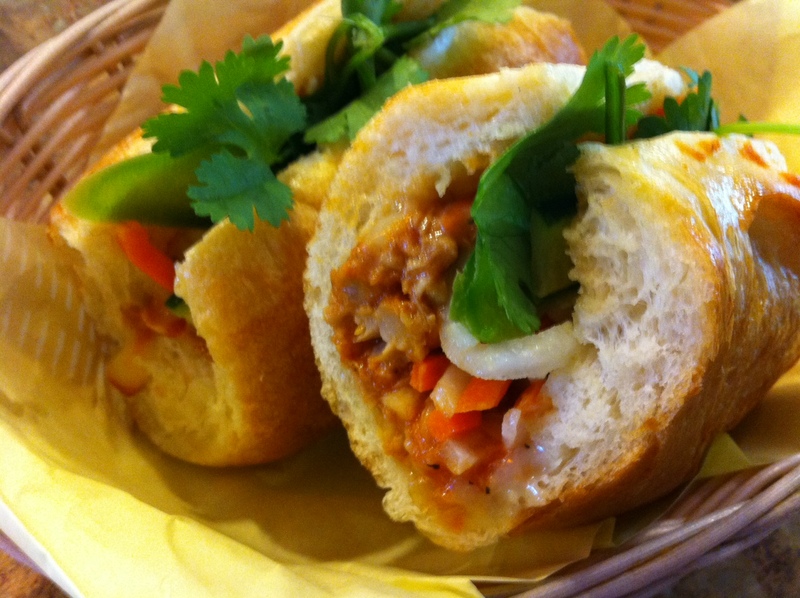 But what separates a terrific banh mi sandwich, the kind found at Mr. Sandwich, from a mediocre-to-worse one, like Lee's and most other places in Las Vegas, is the bread. It's warm. And crackly. It's an exceptional French baguette, and it'd be fine to sit and munch with a few pats of butter; no need to transform it into this culture-spanning masterpiece of a sandwich. But that's what they do here, and behold, they are good. It's sandwich evolution because it's all about the bread, as the fillings serve a complementary role. And I love this backwards sandwich world, because a beautiful, delicious baguette is as close to art as food can get, while meat ... is just meat. Anybody can make a decent hunk of meat. There are many different decent hunks of meat available at Mr. Sandwich, but the best comes inside the Number 40. These are salty, smashed up sardines, doused in a slightly spicy, rich sauce, and slathered in a creamy mayo-type concoction. There's just the right portion of fishy goodness inside our beloved baguette, augmented by -- of course -- do chua, that snappy combination of fresh pickled carrot and daikon, plus raw cilantro, jalapeno and cucumber. Super clean tastes across the board, decadence with the sardines, garden goodness holding it down. Mr. Sandwich, you should be annointed to Sir Sandwich status.